James Monroe expressed his thoughts on how foreign policy should be conducted at his seventh annual message to Congress on December 2, 1823. His words are considered an essential part of America's political history and became known as "the Monroe Doctrine." The political system of the allied powers is essentially different in this respect from that of America. This difference proceeds from that which exists in their respective Governments; and to the defense of our own, which has been achieved by the loss of so much blood and treasure, and matured by the wisdom of their most enlightened citizens, and under which we have enjoyed unexampled felicity, this whole nation is devoted. 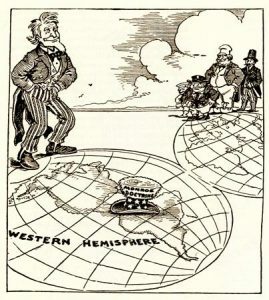 We owe it, therefore, to candor and to the amicable relations existing between the United States and those powers to declare that we should consider any attempt on their part to extend their system to any portion of this hemisphere as dangerous to our peace and safety. Our policy in regard to Europe, which was adopted at an early stage of the wars which have so long agitated that quarter of the globe, nevertheless remains the same, which is, not to interfere in the internal concerns of any of its powers; to consider the government de facto as the legitimate government for us; to cultivate friendly relations with it, and to preserve those relations by a frank, firm, and manly policy, meeting in all instances the just claims of every power, submitting to injuries from none. The complete transcript may be read online through the National Archives website.